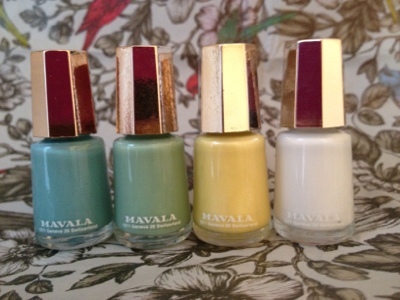 Mavala are a Swiss nail polish company that make a wide variety of shades in super cute 5ml bottles. 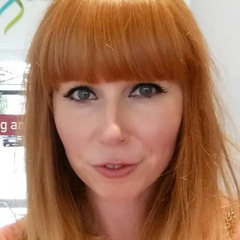 I was recently sent four of their shades* to review that were used in Holly Fulton's Spring Summer 13 show at London Fashion week. The shades are perfect for spring. 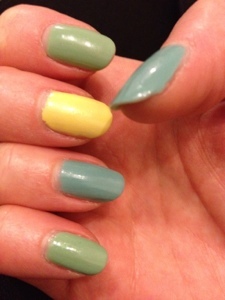 There are three pastels shades: Lagoon - a soft blue, Aquamarine - a pastel green and Lemon Cream - a buttercup yellow. 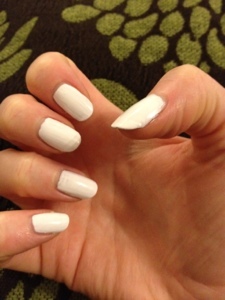 There's also a white polish that I thought was a little unusual, but I was intrigued to see if it would look good, or more like when you used to Tippex your nails at school (just me?). The polishes go on really smoothly, and despite the small bottles, still have a good size brush so you can apply in three stripes down the nail. With the exception of Lemon Cream, I only needed two coats of each polish, but I did find that Lemon Cream needed three to be fully opaque. This wasn't too much of an issue though as they all dried really quickly. 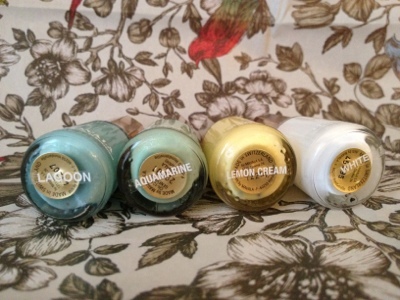 Out of the three pastel shades I think that Lemon Cream is probably my favourite. It's really summery and although it isn't a shade I would normally pick myself, I actually loved it on my nails. The white shade was also a bit of a revelation. 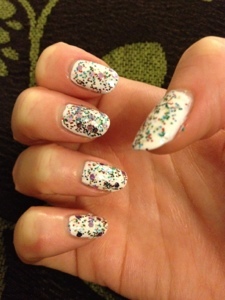 It's really glossy, so looks good alone, and I also used it as a base colour for a rainbow glitter I have. I had quite a lot of positive comments about the glitter on white so this might be something I have to do again in the future! One thing I love about these polishes is the small bottle. I don't know about you, but for polish junkies like me, I have never finished a bottle. With these, it means I can still try out lots of colours (they have over 200! ), but without ending up with loads of gloopy polishes a year down the line. Mavala polishes retail at £4.50 which I don't think is too bad for a quality polish. I'd compare the quality to Essie, which definitely puts them high up on my list! You can pick them up from John Lewis and Debenhams. I only have one Mavala nail polish from one of the GlossyBoxes and it is ok. I actually really like white nail polish and so far only found Natural Collection to have white one in their range, so it's good to know about alternative! Lemon cream looks perfect for spring! I love Mavala polishes, the small bottles are perfect for travelling.